L ondon Web distributes high quality secure, protective cases and free standing kiosks for all models of iPad for commercial deployment in work, outdoor and retail environments. The iPad is being rolled out in many industries such as NHS Hospitals, Construction, Customer Surveys, Retail, Military, Emergency Services and Education where these expensive mobile devices need to be protected against damage, infection control and theft. 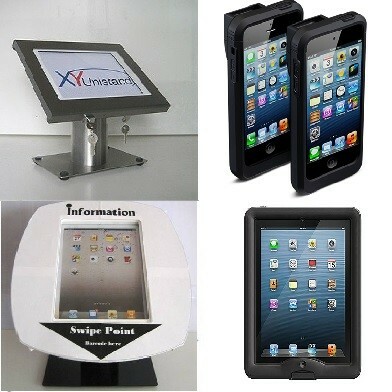 Please click here to see our catalogue to choose the most suitable product solution for your iPad deployment. These iPad cases are hard wearing and durable plus are cleanable with anti-microbial or detergent wipes.